The Fourteen Points was a major policy position by U.S. President Woodrow Wilson, expressed in a speech to Congress on January 8, 1918. It was a peace plan designed to rally opponents of the war in Germany, and it succeeded in that main goal. Points 4-14 were largely realized in fact by 1922. Parts of the first three points were adopted in the long run, and even in the 21st century are a basis of world diplomacy. The plan expressed of Wilsonian idealism in foreign policy, that is, "Wilsonianism." The goal was to identify the main underlying causes of war in the entire world, and to eliminate or minimize them. The first five points were broad in scope: open diplomacy; freedom of the seas; the beating down of economic barriers; the reduction of armament; and the adjustment of colonial claims on a fair basis. There followed Wilson's formulas for applying justice to specific countries or areas. The 14th point was a declaration in favor of an Association of Nations (or League of Nations) to resolve unexpected future conflicts and thus guarantee world peace. In three followup addresses, Wilson set forth elaborations, clarifications and new point, bringing the total proposals to twenty-three. Wilson sought a just and lasting peace; no bartering of ethnic groups; the satisfaction of legitimate national aspirations; honorable international dealing; the destruction of arbitrary militarism; and territorial adjustments in the interests of the peoples concerned, or "self determination." He was vague on the rights of minority groups in areas where self-determination would be controlled by ethnic majorities. Wilson did not invent new terms; he pulled together the best of existing war aims, including many that had been expressed by the British and a few that originated with the Germans and the Bolsheviks, and then added a few of his own. Walter Lippmann helped draft the speech. Wilson's timing was brilliant; it was the combination that was so powerful: here was an authoritative voice, unburdened by any treaty, who proclaimed what many saw as the best possible outcome of the war, and one that would justify the horrible events by cleansing the earth and opening up a peaceful utopia. Europe went wild when he arrived in Paris, for Wilson had made himself the most trusted man in the world. The promise of national self-determination aroused audiences in Ireland, Eastern and Central Europe, Asia and the Middle East, and remains a powerful idea in the 21st century. Much of the speech was drafted by aide Walter Lippmann. The details of Wilson's January 8, 1918, speech were based on reports generated by “The Inquiry,” a group of about 150 political and social scientists organized by Wilson’s adviser and long-time friend, Col. Edward M House. Their job was to study Allied and American policy in virtually every region of the globe and analyze economic, social, and political facts likely to come up in discussions during the peace conference. The team began its work in secret and in the end produced and collected nearly 2,000 separate reports and documents plus at least 1,200 maps. In the speech, Wilson directly addressed what he perceived as the causes for the world war by calling for the abolition of secret treaties, a reduction in armaments, an adjustment in colonial claims in the interests of both native peoples and colonists, and freedom of the seas. Wilson also made proposals that would ensure world peace in the future. For example, he proposed the removal of economic barriers between nations, the promise of “self-determination” for those oppressed minorities, and a world organization that would provide a system of collective security for all nations. Wilson’s 14 Points were designed to undermine the Central Powers’ will to continue and to inspire the Allies to victory. The 14 Points were broadcast throughout the world and were showered from rockets and shells behind the enemy’s lines. The speech was widely hailed by public opinion in the U.S. and Europe, and drove a wedge between the German leaders and the German people, who welcomed Wilson's formula. The Fourteen Points thus played a major role in Germany's surrender. The Fourteen Points made Wilson the hero of the world as the victors gathered in Paris to write the terms that were to be imposed upon defeated Germany. Although Wilson in fact gained most of his points, he was dismayed to realize that Britain, France, and Italy wanted revenge and humiliation for Germany. They wanted huge cash reparations so that Germany would pay the entire cost of the war, including veterans' benefits. The French government demanded high reparations from Germany to pay for the past and future costs of the war to France. Britain, as the great naval power, did not want freedom of the seas. Wilson compromised with Georges Clemenceau, Lloyd George, and many other European leaders during the Paris Peace talks to ensure that most of the points, and especially the fourteenth point, the League of Nations, would be established. Wilson’s capstone point calling for a world organization that would provide some system of collective security was incorporated into the Treaty of Versailles. This organization would later be known as the League of Nations. 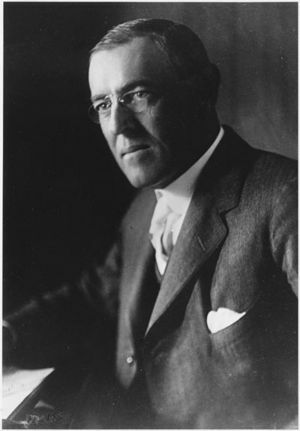 Though Wilson launched a tireless missionary campaign to overcome opposition in the U.S. Senate to the adoption of the treaty and membership in the League, the treaty was never adopted by the Senate, and the United States never joined the League of Nations. Wilson would later suggest that without American participation in the League, there would be another world war within a generation. Once more, as repeatedly before, the spokesmen of the Central Empires have indicated their desire to discuss the objects of the war and the possible basis of a general peace. Parleys have been in progress at Brest-Litovsk between Russian representatives and representatives of the Central Powers to which the attention of all the belligerents have been invited for the purpose of ascertaining whether it may be possible to extend these parleys into a general conference with regard to terms of peace and settlement. The Russian representatives presented not only a perfectly definite statement of the principles upon which they would be willing to conclude peace but also an equally definite program of the concrete application of those principles. The representatives of the Central Powers, on their part, presented an outline of settlement which, if much less definite, seemed susceptible of liberal interpretation until their specific program of practical terms was added. That program proposed no concessions at all either to the sovereignty of Russia or to the preferences of the populations with whose fortunes it dealt, but meant, in a word, that the Central Empires were to keep every foot of territory their armed forces had occupied—every province, every city, every point of vantage—as a permanent addition to their territories and their power. Open covenants of peace must be arrived at, after which there will surely be no private international action or rulings of any kind, but diplomacy shall proceed always frankly and in the public view. Adequate guarantees given and taken that national armaments will be reduced to the lowest points consistent with domestic safety. A free, open-minded, and absolutely impartial adjustment of all colonial claims, based upon a strict observance of the principle that in determining all such questions of sovereignty the interests of the population concerned must have equal weight with the equitable claims of the government whose title is to be determined. The evacuation of all Russian territory and such a settlement of all questions affecting Russia as will secure the best and freest cooperation of the other nations of the world in obtaining for her an unhampered and unembarrassed opportunity for the independent determination of her own political development and national policy, and assure her of a sincere welcome into the society of free nations under institutions of her own choosing; and, more than a welcome, assistance also of every kind that she may need and may herself desire. The treatment accorded Russia by her sister nations in the months to come will be the acid test of their good will, of their comprehension of her needs as distinguished from their own interests, and of their intelligent and unselfish sympathy. For such arrangements and covenants we are willing to fight and to continue to fight until they are achieved; but only because we wish the right to prevail and desire a just and stable peace such as can be secured only by removing the chief provocations to war, which this program does remove. We have no jealousy of German greatness, and there is nothing in this programmer that impairs it. We grudge her no achievement or distinction of learning or of pacific enterprise such as have made her record very bright and very enviable. We do not wish to injure her or to block in any way her legitimate influence or power. We do not wish to fight her either with arms or with hostile arrangements of trade if she is willing to associate herself with us and the other peace- loving nations of the world in covenants of justice and law and fair dealing. We wish her only to accept a place of equality among the peoples of the world, -- the new world in which we now live, -- instead of a place of mastery. Wilson, Woodrow. President Woodrow Wilson's Fourteen Points (1918). This page has been accessed 22,779 times.